This may be the most bizarre party of all time. 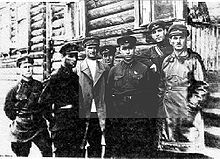 The former local officials and prison wardens at the notorious Usolsky prison camp in the Urals held a 75th anniversary celebration of their gulag and the “traditions in the camp that still hold value today.” We have previously seen efforts to rehabilitate Josef Stalin but the reunion of gulag guards is a bit much to take. That bravery included watching almost one out of five workers die from malnutrition and overwork. I heard that there used to be reunions of all the guards from Andersonville. Y’all remember Andersonville dont ya? That was some Gulag in some state named after some guy’s wife. Georga. Of course Georgia was part of a confederacy. The prisoners starved. Some died from starvation or from untreated wounds from the war. The survivors were liberated. The liberators noticed that there were crops in the fields nearby this barbed wire prison full of starving Americans. None of the farmers thought to feed the dying Americans. None of the guards thought to go get some of those melons and feed the prisoners. Only one guy was prosecuted and he was hanged. Much of this is forgotten. We are the Exceptional country. A “Gulag” is a good name. We should use the American word. Andersonville. I guess the guards from Andersonville never had reunions. Some joined a kinship group. It was klanish of sorts. Birds of a feather flock together. War crimes against some lead to war crimes against others. Generational. Chain gangs. Rick Perry. Terry Eastland. Governor Wallace. Faubus. Segregation Now, Segregation Forever! The Exceptional country. Dont even get me started on dog pounds. Millions of course died in Stalin’s gulag system and Usolsky stood out for its cruelty. Just to make sure: what millions of dead are you talking about? There were 642 980 people from 1921 to 1954 sentenced to death, even less were actually executed. About 2.7 millions were prisoners (including non-political criminals). USA is not that far from Stalin, I guess. Or taking proportions between prisoners and free persons did USA surpass Stalin’s USSA? Well. although I’m against demonizing historical figures, especially by those with somewhat poor knowledge of the subject, this party certainly seems strange. Franklin Roosevelt called him “Uncle Joe”. Joe was ok as long as he was putting Krauts in a Gulag. That is so wrong. Only 20 percent survived and could be rehabilitated later, by some quirk of Stalin or other high placed person. In New Orleans, they’ll use just about any excuse to throw a party, but even the yats have limits. How many Americans are currently being held incommunicado by this sham president who would have everyone believe he’s a constitutional expert? Stalin completely eradicated everyone who knew him and what he was doing before the October revolution. He was able to get away with it because of the party rules that called for party discipline and rules for meetings that allowed a small group to control the agenda. Obama has secret documents that allow him to violate American and international law with impunity. His rhetoric sounds hood, but his actions are those of an evil despot. The only question now is how many Americans ate going to be secretly killed it disappeared before this country emerges from our generation long descent into this authoritarian nightmare? The Russians have a serious problem. the prisoners are there in spirit. It was a “we were only following orders” type of party. They were with us..so they get a free pass….. I bet some of the former prisoners would LOVE to be there for the celebration. Particularly if they were allowed to bring bats and chains to the party. I imagine Stalin would have embraced drone strikes against Russian citizens but only after a proper people’s trial court. Disgusting. These workers hold be celebrating in jail.